Prominent & Leading Manufacturer from Mumbai, we offer air handling unit, dehumidifier air handling unit and standard air handling unit. Air Handling Unit is technically developed product which offers a great value and alternative to the traditional field trade methods. 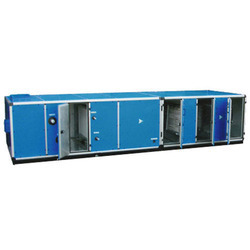 We are leading manufacturer and exporter of Dehumidifier Air Handling Unit and our product is made up of good quality. Our Dehumidifier Air Handling Unit offered by us are precision fabricated using aluminium extruded section frame structures with outer & inner panels made of pre coated sheet that can be made available in galvanized, aluminium or stainless steel options. The large number of small vents allow for effective air flow evenly across the room. This assists the optimum performance of the machine. 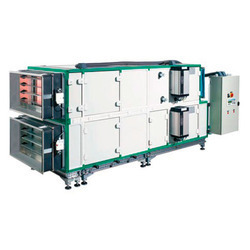 We are instrumental in offering Standard Air Handling Unit, which helps in the production of pharma products. This equipment is used to distribute dehumidified dry air. 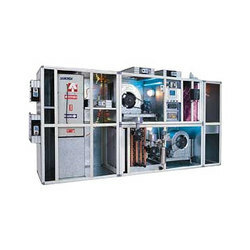 This Standard Air Handling Unit cater to the demands of numerous industries such as food, pharma, paper, textile, tile, chemical and jute industries. Furthermore, this product is also used in the ambits of hospitals, wood and metal parts. From survey to ducting and validation, we provide the consumers wholesome AHU solutions. Moreover, We also bring forth IQ, DQ and PQ documentation which is at par with GMP, USFDA and FDA standards. With an aim to meet the requirements of our clients, we provide the equipment in Horizontal, vertical,double deck models, single/double skin 25/50 mm PUF insulated panels and ceiling suspended models.